GtkFrame implements AtkImplementorIface and GtkBuildable. The frame widget is a Bin that surrounds its child with a decorative frame and an optional label. If present, the label is drawn in a gap in the top side of the frame. 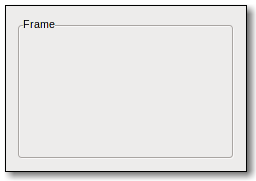 The position of the label can be controlled with gtk_frame_set_label_align(). The GtkFrame implementation of the GtkBuildable interface supports placing a child in the label position by specifying "label" as the "type" attribute of a <child> element. A normal content child can be specified without specifying a <child> type attribute. Creates a new GtkFrame, with optional label label . If label is NULL, the label is omitted. Sets the text of the label. If label is NULL, the current label is removed. the text to use as the label of the frame. Sets the label widget for the frame. This is the widget that will appear embedded in the top edge of the frame as a title. Sets the alignment of the frame widget's label. The default values for a newly created frame are 0.0 and 0.5. The position of the label along the top edge of the widget. A value of 0.0 represents left alignment; 1.0 represents right alignment. The y alignment of the label. A value of 0.0 aligns under the frame; 1.0 aligns above the frame. If the values are exactly 0.0 or 1.0 the gap in the frame won't be painted because the label will be completely above or below the frame. Sets the shadow type for frame . the text in the label, or NULL if there was no label widget or the lable widget was not a GtkLabel. This string is owned by GTK+ and must not be modified or freed. Retrieves the X and Y alignment of the frame's label. See gtk_frame_set_label_align(). location to store X alignment of frame's label, or NULL. Retrieves the label widget for the frame. See gtk_frame_set_label_widget(). the label widget, or NULL if there is none. Retrieves the shadow type of the frame. See gtk_frame_set_shadow_type(). the current shadow type of the frame. Text of the frame's label. A widget to display in place of the usual frame label. The horizontal alignment of the label. The vertical alignment of the label. Deprecated property, use shadow_type instead. Appearance of the frame border.